Environmental economist with 10 years of experience in promoting sustainable development at local, national and international level. Claudia worked mainly for public institutions and government departments such as the Italian Ministry of Environment with the role of Sustainable Development and Cohesion Policy expert supporting the National Environmental Authority and representing Italy in European working groups. 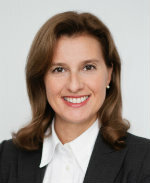 In Vienna she worked at the Energy Community Secretariat as coordinator of the Regulatory Board team. She has also worked in international research projects on environmental taxation and on gender issues and has co-authored several publications. Since 2014 Claudia is also President and Board chairwoman of the Vienna Family Network supporting 2500 international families in their integration and settlement in a foreign country.